2 States is a 2014 Indian romantic comedy film co written and directed by Abhishek Varman based on the 2009 novel 2 States: The Story of My Marriage written by Chetan Bhagat. It is produced by Karan Johar and Sajid Nadiadwala. The film stars Arjun Kapoor and Alia Bhatt in lead roles. The film was released on 18 April 2014. Krish Malhotra (Arjun Kapoor), a fresh Engineer from IIT Delhi, now a student pursuing his MBA at the IIM Ahmedabad, Gujarat, comes from a troubled, rich family of Punjabi heritage. He meets his classmate Ananya Swaminathan (Alia Bhatt), economics topper in her college, who comes from a conservative Tamil Brahmin family. Krish and Ananya, initially quarrel, but soon become friends and start studying together. Soon they begin dating, and stay together for their next 22 months on the IIM campus. Krish confides in Ananya that his real passion is writing, which he wants to pursue a career in. They both have become close to each other and fall for each other during the stay in IIM. Krish gets selected in the campus drives for Yes Bank. He immediately rushes to the next room and proposes to Ananya, in the middle of her interview. She accepts and then gets selected for Sunsilk. When they complete their graduation, Krish and Ananya decide to get married. They introduce their parents to each other at the convocation ceremony. To their dismay, Krish's loud Punjabi mother Kavita (Amrita Singh) does not get along with Ananya's reserved Tamil parents Radha (Revathy), and her husband. (Shiv Kumar Subramaniam). After graduation, Ananya begins her marketing job in her hometown Chennai and Krish goes back to his own hometown Delhi, with the choice of workplace in his own hands. Krish's brash family urges him to stay in Delhi and try to discourage him from his interest in writing. They also criticize his relationship with Ananya, and tell him to get into an arranged marriage with a Punjabi girl. It is also evident that there is tension between Krish and his rich alcoholic father Vikram (Ronit Roy). Krish leaves his dysfunctional family and starts his banking job in Chennai. During this time, he tries very hard to win over Ananya's family. He initially steps on the threshold of their house entrance unknowingly and messed up the rangoli, being unaware of Tamil Hindu religious practices, making Ananya's father upset. He tutors her younger brother for IIT entrance exams, gets her mother an opportunity to sing at an event for his workplace and helps her father create his first PowerPoint presentation. After all his effort, Ananya's family agrees to the marriage with Krish, when Krish symbolically proposes to each member of the family. Krish and Ananya then travel to Delhi to win over Krish's family. Initially, Kavita and her family are hostile towards Ananya but come to like her after she saves Krish's cousin's wedding from being canceled due to a dispute over excessive dowry, she is also accepted. Krish and Ananya decide to take a vacation to Mumbai with their families before the wedding. The vacation does not go as planned when Kavita makes continuous snide remarks about Tamilian culture. Furthermore, Ananya and her parents overhear Krish falsely assuring his mother that she can treat Ananya however she wants after they are married. Having had enough of the insults, Ananya breaks up with Krish and both return to their respective hometowns. Krish and Ananya find it hard to live without each other. Sometime later, he gets a call from Ananya, who reveals that Krish's father had secretly come down to Chennai to speak to her parents, apologizing for his wife's shallow behavior, in an effort to change his personality. This allows for Krish and Ananya to finally get happily married, with Krish and his Punjabi family traveling by train to Chennai for the wedding. The father initially said that he will not attend the wedding to prevent any further abuse, but at the last minute he flies down to Chennai with Krish seeing his rental car outside of the hotel and to the surprise of his mother, announcing that his father has come to the wedding during an argument with the priests due to the absence of the father. They become parents to twin boys and Krish resigns from banking and, publishes his book 2 States based on his and Ananya's life. The first choice for the lead pair in the film had been Saif Ali Khan and Priyanka Chopra and the film was to be directed by Siddharth Anand. Later, it was announced that Shah Rukh Khan and Asin Thottumkal would play lead roles and the film was to be directed by Vishal Bhardwaj. The role of Krish Malhotra was also offered to Imran Khan who instead chose to work on Matru Ki Bijlee Ka Mandola. Finally, Arjun Kapoor was cast as the lead. The female lead was then offered to Anushka Sharma who rejected it as she didn't find the role interesting enough and later Alia Bhatt signed on. Amrita Singh and Ronit Roy were cast as Arjun Kapoor's parents and Revathy and Shiv Kumar Subramaniam were cast as Alia Bhatt's parents. The song "Offo" was choreographed and conceptualized by Remo D'Souza as a celebration of several Indian festivals in a time lapse of almost one year. It was shot over four days at IIM Ahmedabad campus and Filmistan Studio in Mumbai. The film score was composed by Tubby-Parik while the songs were composed by Shankar-Ehsaan-Loy, while the lyrics for the songs were penned by Amitabh Bhattacharya. The first song, Offo, sung by Aditi Singh Sharma and Amitabh Bhattacharya, released on March 7, 2014. The second song, Locha-E-Ulfat, sung by Benny Dayal, released on March 13, 2014. The soundtrack of the film released on March 14, 2014. The medley song "Isaiyin Alai" at the Concert was sung by Mahalaxmi Iyer. Shankar-Ehsaan-Loy won the filmfare and IIFA Awards 2015 for this film. According to Box Office India, 2 States had "excellent" first day figures of ₹120 million (US$1.7 million). The collections for second day were around ₹117.5 million (US$1.6 million) taking its two-day total to ₹237.5 million (US$3.3 million), receiving a "fantastic" response in circuits like Mumbai, Mysore, Delhi-UP, CP Berar, CI, Nizam and Rajasthan. The film was declared a "Super Hit" by Box Office India in light of its first two days' performance. With a very good run in multiplexes and single screens alike, it managed a three-day nett of ₹280 million (US$3.9 million). 2 States had a final domestic nett of ₹810.91 million (US$11 million). According to Box Office India, 2 States grossed US$5.85 million internationally, and was the second highest overseas grosser of 2014 in Bollywood after Jai Ho at that point. Taran Adarsh of Bollywood Hungama awarded the film 4.5 out of 5 stars, and noted, "On the whole, 2 States is one of the finest movies to come out of the Hindi film industry of late. This is one of those rare Hindi movies that commands a repeat viewing. Strongly recommended!" 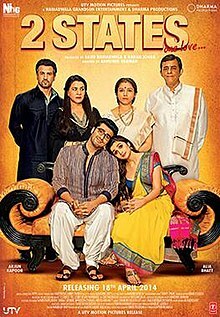 Critic Saurabh Dwiwedi, writing for India Today, gave the film 4 out of 5 stars, and published, "2 States can be a good mirror for parents to understand their children. So take along your parents and enjoy the film." Meena Iyer of The Times of India gave the film 3.5 out of 5 stars, and wrote, "What makes 2 States work is the simple narrative told humorously. Adapted as it is, from one of author Chetan Bhagat's best-selling works, the film, just like the book before it, is light-hearted. Chetan's funny one-liners and life-view are studiously borrowed by the director for his screen outing. And though there is a sense of deja-vu, for those who have read the book, the movie still manages to charm and surprise." Paloma Sharma of Rediff.com gave the movie 3.5 out of 5 stars and opined, "There's nothing that should keep you from watching 2 States". Mohar Basu of Koimoi gave the film 3 out of 5 stars, and wrote, "2 States is barely unwatchable but misses the magic of Chetan Bhagat’s novel. As a stand alone, it is endearingly done with Alia and Arjun’s scorching chemistry coming off as adorable. The Bhagat fan in me is disappointed but the cinegoer isn’t." DNA posted, the first half of the film is light and breezy and the second dramatic and emotional, perhaps a better balance would have helped the post interval portion which seems heavy. Music Composer of The Year – Shankar-Ehsaan-Loy for "Mast Magan"
The film has been remade in Telugu with same name starring Adivi Sesh and Shivani. ^ "2 STATES (PG)". British Board of Film Classification. 14 April 2014. Retrieved 14 February 2015. ^ a b "2 States – Movie – Box Office India". boxofficeindia.com. Retrieved 21 October 2017. ^ "Arjun Kapoor and Alia Bhatt in 2 States". India Today. Retrieved 27 December 2013. ^ "2 States Cast and Crew". bollywoodhungama.com. Retrieved 29 October 2012. ^ "Cast,Crew,Actorstresses,Director and Producers of 2 States". Oneindia.in. Retrieved 29 October 2012. ^ "Movie Review: 2 States – or how to woo the parents – Blogs". Dawn.Com. Retrieved 27 September 2015. ^ "Ronit Roy plays negative role in 2 States". India Today. Retrieved 27 December 2013. ^ ""I am doing a negative role in 2 States" says Ronit Roy". IBN Live. Retrieved 27 December 2013. ^ "Saif & Priyanka in Siddharth Anand's adaptation of Chetan Bhagat's '2 States' | Bollywood News | Hindi Movies News | News". BollywoodHungama.com. 14 October 2010. Retrieved 27 September 2015. ^ "Shah Rukh Khan, Priyanka Chopra re-ignite 2 States". Timesofindia.indiatimes.com. 23 June 2011. Retrieved 27 September 2015. ^ "Casting chronicle: One's miss is another's hit". India Today. Retrieved 5 May 2014. ^ "SRK Wins Face Of Romantic Music Award At Radio Mirchi Music Awards". Indiatimes.com. 28 February 2014. Retrieved 27 September 2015. ^ "5 Films Anushka Sharma Rejected & We Thank Her For That!". www.filmibeat.com. 10 December 2017. Retrieved 28 December 2017. ^ "Arjun, Alia starrer 2 States goes on floor today". Bollywood Hungama. Bollywood Hungama News Network. 29 January 2014. Retrieved 9 March 2014. ^ "Arjun Kapoor, Alia Bhatt at IIM Ahmedabad for 2 States". The Indian Express. 15 April 2013. Retrieved 25 April 2013. ^ "'2 States' brings Ahmedabad centre to a standstill". Daily News and Analysis. 10 August 2013. Retrieved 25 April 2013. ^ "Alia Bhatt sports an Indian Fusion Look in 2 States". IANS. news.biharprabha.com. Retrieved 28 February 2014. ^ "Being a Tamil Girl was not difficult for Alia Bhatt in 2 States". IANS. news.biharprabha.com. Retrieved 7 March 2014. ^ "Festival soiree". The Indian Express. 16 April 2014. Retrieved 29 April 2014. ^ "2 States Has Excellent First Day". Box Office India T. Box Office India. Retrieved 19 April 2014. ^ a b c "2 States Emerges Biggest Hit Of 2014". Box Office India Trade Network. Box Office India. 20 April 2014. Retrieved 20 April 2014. ^ "Two Day Circuit Figures – 2 States". Box Office India Trade Network. Box Office India. 20 April 2014. Retrieved 20 April 2014. ^ "2 States Has Excellent Weekend". Box Office India Trade Network. Box Office India. 21 April 2014. Retrieved 21 April 2014. ^ "All Time Top Ten Under 50 Crore Budget Grossers – 2 States Tops". Box Office India. 14 May 2014. ^ "Boxoffice". Boxofficeindia.com. 7 May 2014. Retrieved 27 September 2015. ^ "Top Ten Worldwide Grossers 2014". Box Office India. 4 February 2015. ^ Adarsh, Taran. "2 States". Bollywood Hungama. Retrieved 20 April 2014. ^ Dwiwedi, Saurabh. "Movie Review: 2 States is a tale of journey from love to marriage". India Today. Retrieved 20 April 2014. ^ Iyer, Meena. "2 States". The Times of India. Retrieved 20 April 2014. ^ "Review: Nothing should keep you from watching 2 States – Rediff.com Movies". Rediff.com. 18 April 2014. Retrieved 27 September 2015. ^ Basu, Mohar. "2 States Review". Koimoi. Retrieved 20 April 2014. ^ Sarita A Tanwar (17 April 2014). "Film review: Two states starring Alia Bhatt and Arjun Kapoor is realistic and fresh | Latest News & Updates at Daily News & Analysis". Dnaindia.com. Retrieved 27 September 2015. ^ Chopra, Anupama. "Movie review by Anupama Chopra: 2 States' story is its weakest link". The Hindustan Times. Retrieved 19 April 2014. ^ Chatterjee, Saibal. "2 States: movie review". NDTV. Retrieved 20 April 2014. ^ Gupta, Shubra. "2 States movie review : Alia Bhatt is easy, fresh and natural". The Indian Express. Retrieved 20 April 2014. ^ "Adivi Sesh, Shivani to star in Telugu remake of 2 States; film to be 'slightly peppier' than original". Firstpost. Retrieved 8 February 2018. ^ "2 States' Telugu remake to go on floors soon". Times of India. Retrieved 1 April 2018.